There is nothing wrong with googly-eyed anime characters. There is nothing wrong with paper masks. But giant-eyed paper masks on humans in real world settings? Yikes! 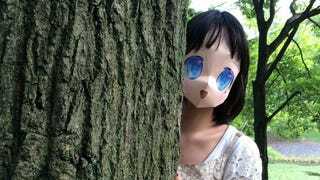 Recently a Tumblr site called 2.5D Mask has been uploading photos of a woman wearing different kinds of anime inspired paper masks. Why 2.5? Because, it seems, like other attempts at recreating anime characters in the real world, these masks are made from flat sheets of paper. The masks are also available for others to download, print out, and make. All you need are scissors, glue, rubber bands, and A4-sized paper. There's already a hashtag (#2_5Dmask) for people to share their creations on Twitter. Of course there is! Below, you can see some of the photos popping up online. Bad news, the Tumblr site says that more masks are "coming soon." Sorry. I meant, good news?